Professor Noel Fitzpatrick is faced with one of his most challenging cases yet. 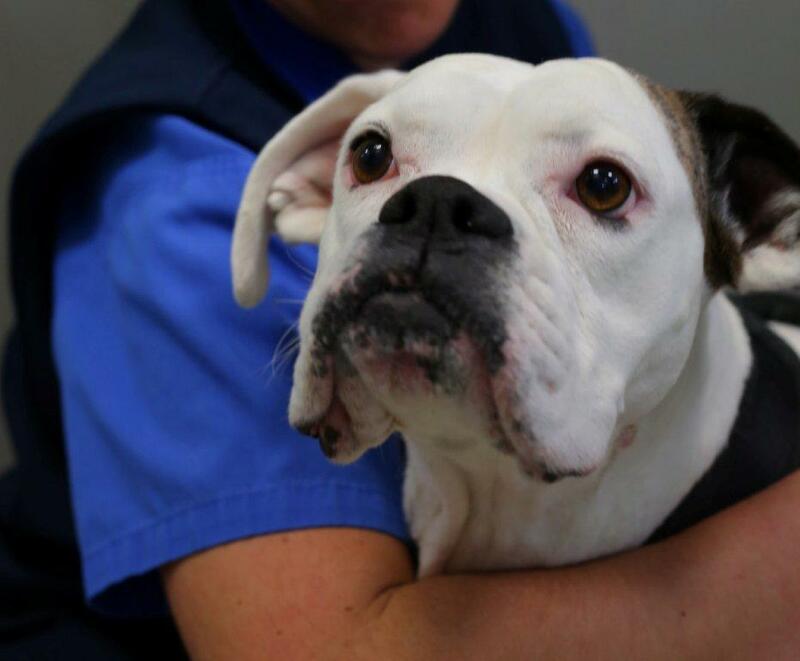 Bella the Boxer is referred to the practice after being involved in a road accident a year earlier that left her with extensive injuries to her pelvis and hind legs. Noel offers the family the option of new stem cell scaffolding technology that has never before been attempted to fill such a large area of lost bone. The procedure comes with significant risk and there are no guarantees of success, but this may be Bella’s last hope. Julie and her husband Peter have lived with Bella since she was puppy. 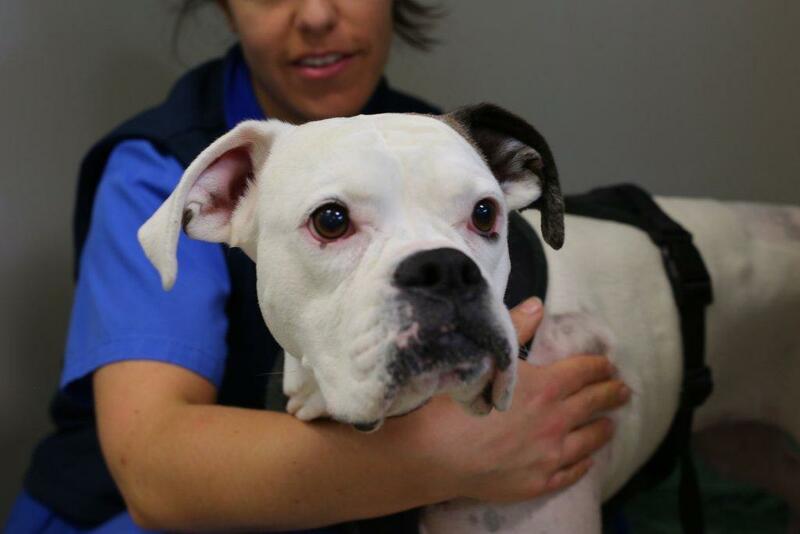 Julie and Peter brought in their white Boxer Bella to see if Noel and his team would be able to provide a last chance at helping her with her extensive problems. A year before she had been involved in a terrible accident resulting in detachment of her pelvis from her spine, multiple pelvic fractures, complex femoral fractures, metatarsal fractures and herniation of her bladder. 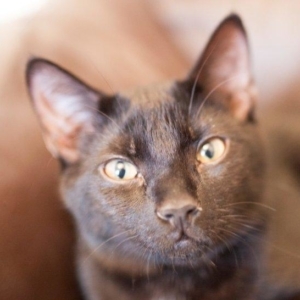 Bella was initially seen by another specialist orthopaedic hospital, who treated her injuries. Whilst her other injuries were relatively easily fixed, the complex fracture in her right femur posed some problems and amputation was recommended, however, the family preferred to try and save her leg and so a repair was carried out. Unfortunately, the repair of Bella’s leg was unsuccessful and over the last few months Bella had been in significant pain and was unwilling to put any weight on her right hind leg, so the family have bought her to see Professor Noel Fitzpatrick in the hope he might have the answers to help Bella. Noel physically examined Bella to fully assess the situation. Noel explained that the bone in her right femur had completely wasted away and the metalwork was falling apart causing movement of the bone. This continuous movement was causing Bella significant pain and so she preferred not to use the leg at all. Noel offered three possible routes to take. One option was to amputate the whole leg but this would be suboptimal due to the surgery Bella had previously had on her left hind limb following the accident. The second was to use a brand new technology that has only recently become available; a three-dimensional titanium scaffold could be placed in the gap in the femur and sprayed with Bella’s own stem cells stimulating new bone to grow into it. The third option was euthanasia. Noel was very clear that whatever the choice, it must be taken with Bella’s best interests in mind. Noel knew that the family did not feel it was the right time to say goodbye and they didn’t want to impact on her left hind limb by amputating the right. No one had ever attempted this new treatment in a defect as big as the one Bella had, but it was theoretically possible and if it were a human and you were about to lose your leg you probably would try it. With the chance that the treatment would be better than the alternatives, the family asked Noel to try and the custom-designed implant was manufactured. In surgery, the first challenge was to remove the existing plates, dead bone and fibrous tissue, and then replace them with the tube-shaped titanium honeycomb mesh and custom plates to hold it in place. Noel had to work through a lot of scar tissue that had formed as a result of multiple surgeries. The plate and screws that had previously been put in to secure her broken leg had easily detached as they were hardly holding onto anything anymore. Additionally, the quadriceps muscles were stuck down to the bone with lots of scar tissue. Once all had been removed, Noel could place the new implant which would bridge the gap of missing bone in Bella’s femur. The implant consisted of a hollow cylinder made out of honeycomb metal, which is shaped like the shaft of a bone and coated in hydroxyapatite, which is a special mineral the bone would grow into. Noel collected bone marrow from Bella’s humerus and stem cells were extracted from it. 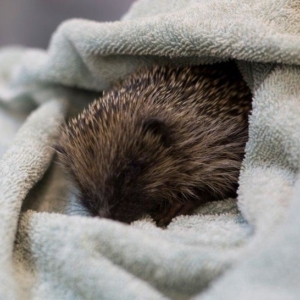 Once the cells were returned and Noel had reached the appropriate point of his surgery the cells were sprayed onto the honeycomb mesh tube alongside a fibrin glue-like substance which encouraged the cells to stick down to where they were sprayed. It took a total of four hours to complete the operation. The postoperative x-ray and CT imaging looked promising and now Noel and the team would have to wait and see if the stem cells would result in new bone growth. Two weeks later Bella was making steady but good progress at the practice. She was finally beginning to use her leg reasonably well. She had a very difficult journey ahead of her still and would require a lot of physiotherapy to counteract the effects of her muscle being stuck down to the bone with scar tissue, but the early signs were encouraging. The implant was stable and there was no trace of infection. With this good news, Bella was able to go home for a few weeks, where her family would continue her care and physiotherapy. Rehabilitation and intense physiotherapy was going to be key to the success of the surgery. Bella needed to have physio at the practice once a week, plus a strict daily regime at home with Julie and her daughter Lorna. 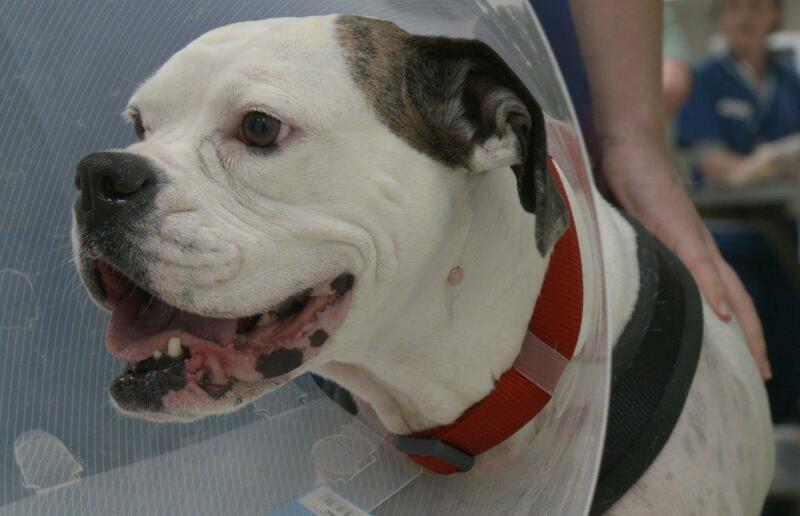 The family returned a further two weeks later to review Bella’s progress. Noel had good and bad news for them. The bone production was unbelievably good but the bad news was that the new bone formation was tying down the muscle again. It is immensely disappointing for the family who had worked very hard for the past couple of weeks, but the physiotherapy was not enough. To try and control the problem, Noel would need to go back into surgery to unstick the muscle from the new bone and put a plastic membrane in, a bio-absorbable polymer to wrap around the metal structure to hopefully prevent the muscle sticking to it. Once the surgery was complete, Bella went into intensive care to recover, but the next day Bella went into relapse. The team gave Bella every possible support to help her through and kept out of pain but over the next few days she became weaker and weaker until Noel and the family had no choice but to amputate her leg, it was the only option she had left to save her life. The following evening Noel had to call the family into the practice as the situation has deteriorated for Bella. She had developed a life-threatening problem with her immune system and developed a horrendous infection. Noel and the team have tried everything to control it, but it was clear that our moral responsibility was to let this lovely girl go. The decision was made that for Bella’s sake the kindest and right thing to do was to let her go. It is easy to show success, and to some extent, it makes for easier compliance with broadcasting rules because there is no fall-out, but that is not real life – real life is a mixture of both success and failure. In this week’s episode, we did our best, but we still failed and we lost a dear friend. Our loss profoundly affected us – but it was a drop in the ocean of the pain of Bella’s beautiful, compassionate and magnificent family. This family were brave enough to allow us to show their journey and I am deeply grateful that they have shared their emotions and their loss with us – because in knowing that we had all done our best, there is peace of mind. In knowing that peace, we might bring hope to millions of animals and human beings who recognise that without hope we are lost, unless we make tough decisions and unless we live with the consequences, we will never make progress and we will never make a real difference to medicine and to society. Unless we have felt pain and loss, we will never really know the true feeling of love and redemption. We can do the same operation on two consecutive days and on one day we will succeed and on another we will fail, having done our very best on both days. This is true whether it is a procedure we do for the hundredth time or the first time. We can only do our best, and sometimes that isn’t enough because biology does not smile that day. These are difficult ethical decisions, but in making them, we genuinely do seek to make the world a better place for the animals that give us so much.